We all know what religion is - or do we? Confronted with religious pluralism and cultural diversity, it manifests itself in many forms. What is Religion? serves not only as an introduction to the different belief systems flourishing throughout the modern world, but asks us to consider how the very boundaries of faith might be drawn now and in the future. How might religion interact with political ends, or permeate culture, society and everyday life? Is the post-secular world in thrall to 'religions' of its own kind - materialism, humanism, medicine, science? And what logic separates 'common-sense' or academic knowledge from the immutable but unstable boudaries of faith? Which is the more certain? What does it mean to believe? Combining clear accounts of contemporary global religious practice with an incisive philosophical interrogation of the dynamics and aims of belief, What is Religion? offers a fresh and wide-ranging introduction to the perennial human questions of ritual, faith, ethics and salvation. 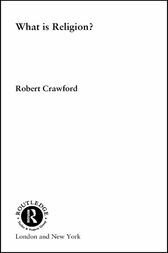 Robert Crawford is a lecturer and tutor at the Open University, and a minister of the United Reformed Church. He has taught in South Africa, Nigeria, America and England, and is the co-author of Can We Ever Kill? as well as accounts of South African aparthied and Ulster Protestantism.